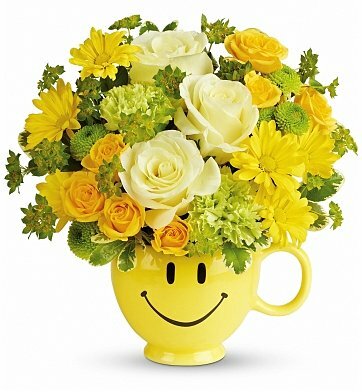 Hand-delivered in a food safe mug for years of satisfied sipping, this cheerful gift of sunshiny blossoms spreads happiness wherever it goes. Yellow Spray Daisies, Lush Greenery and more. You Make Me Smile is a hand delivered gift. These gifts are delivered by one of our local design centers located throughout the United States and Canada. Same day delivery is available for most gifts when ordered before the cutoff time. The cutoff time for You Make Me Smile is 2 PM in the recipient's time zone.